Banpu Infinergy – led by Ms. Somruedee Chaimongkol (4th left), Director, and Ms. Kanokwan Jitchobtham (5th left), Managing Director – announced the purchase of a 25.7 percent stake in Sunseap Group Pte Ltd., the largest and best-established clean energy solutions provider in Singapore – led by Mr.Frank Phuan (3rd left), Co-Founder and Director of Sunseap Group, Mr.Lawrence Wu (2nd left), Co-Founder and Director of Sunseap Group and Mr.Keith Lim (far left), Group Financial Controller – who will share their knowledge and experience in servicing their largest customers in Singapore, which BPIN will in turn apply in delivering services to Thai customers. Banpu Infinergy Company Limited (BPIN), a one-stop provider of total solar energy solutions using advanced technology on the concept “Go Green Together”, has announced the purchase of a 25.7 percent stake in Sunseap Group Pte Ltd., the largest and best-established clean energy solutions provider in Singapore. The investment, which has been made through its subsidiary, BPIN Investment Co., Ltd, is valued around SGD 75 million (equivalent to approximately USD 55.7 million or THB 1,860 million) and makes BPIN the major shareholder in Sunseap Group. Sunseap currently has estimated operating capacity of 93.3 MW that is set to increase to approximately 182.9 MW through secured projects. 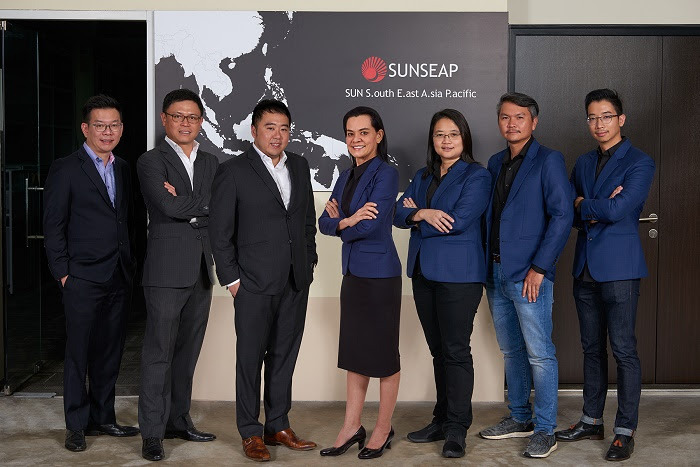 Through this partnership, Sunseap Group will share their knowledge and experience in servicing their largest customers in Singapore such as public sector agencies, educational institutes and leading global companies such as Apple, Housing Development Board, Singapore American School, Raffles Institution, the United Technologies Group, Jurong Port, ABB and Panasonic , which BPIN will in turn apply in delivering services to Thai customers. The investment will give Banpu Infinergy an increase in power generating capacity of 47 MW of signed projects, thus enhancing its 5-year power-generating capacity goal of 300 MW. Banpu Infinergy Company Limited is a subsidiary of Banpu Public Company Limited, a leading Asia’s energy company. As a total one-stop solar energy provider, the company’s services include consultation, system design, installation, inspection and maintenance for industrial and private use with the aim of reducing electricity costs. Banpu’s expertise from operating solar farm plants in China and Japan combined with more than 30 years of experience as the leading energy provider both locally and internationally form a solid basis for Banpu Infinergy to lead Thailand towards a greener future.